Bo’s Coffee is locally owned coffee shop established in 1996. Since then Bo’s Coffee has steadily been in the market opening branches in key cities in the Philippines. It was then predicted that Bo’s Coffee would eventually decrease their sales when Starbucks and other international coffee shops opened such as Coffee Bean and Seattle’s Best but surprisingly Bo’s Coffee stayed in the game with incredibly good sales – repeat costumers, loyal drinkers and even new tasters flock to Bo’s Coffee. I am personally a fan of Bo’s Coffee and Starbucks but I often go to Bo’s Coffee most of the time. I feel more comfortable in the place. Their chocolate drinks which I often ordered is delicious. They are also more open for people who wishes to stay longer and work. They have designated areas for laptop users and they offer free wi-fi too! Because of this, you’ll see people doing their stuff on their laptop — like me blogging, some are checking data’s on excel files, some doing online business, some studying and some are plainly updating their Facebook. If you stay a little bit longer, you can also see business men having their meetings at Bo’s Coffee. This is a more common occurrence than in Starbucks. I hear them talking about real estates and other sales. On a rare occasion, I hear wedding being planned. Nice! For me, this is entertainment I do not get from television nor from the net. 🙂 This is one of the fascinating reasons why I love killing my time inside a buzzing coffee shop! 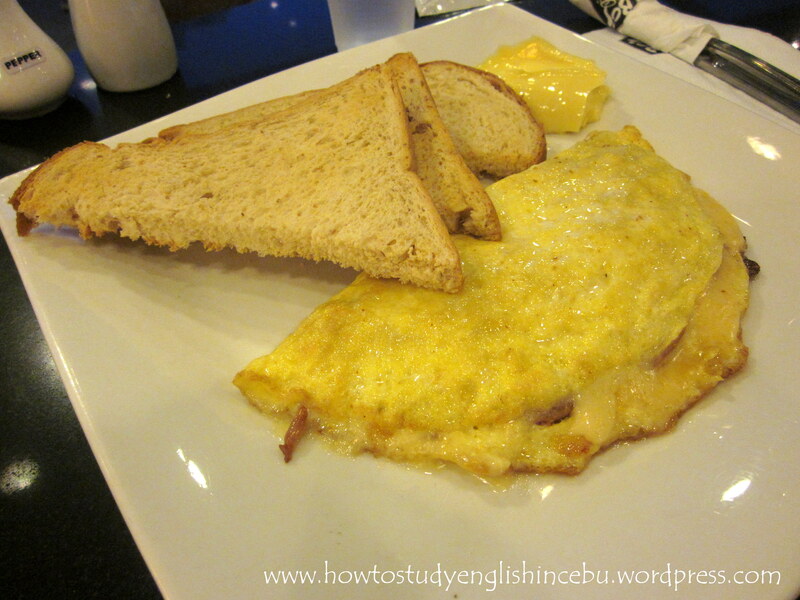 On that day, I ordered HAM AND CHEESE OMELETTE for 150 Php (4USD). The taste was okay. There was nothing really special in it except for the generous cheese inside. I did not really like it because the omelette was a oily. The cheese made the omelette salty plus the butter on the side was also salty. As I spread the butter on top of the wheat bread and place a slice of the omelette, I could barely swallow it due to it’s too salty taste. I just wished they used unsalted butter. In the end, I ignored the butter and ate the bread and the omelette instead. For this, I do not recommend. 😦 However, other food stuff in BO’s are worth every penny such as their sandwiches, cakes and cookies.